Nick Fury: Agent of S.H.I.E.L.D. (1998): This is the best thing David Hasselhoff has ever done! 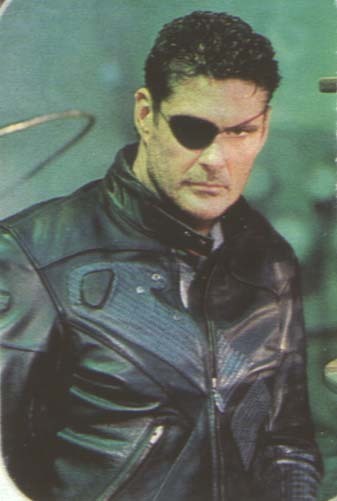 I like "Knight Rider" and some of his movies, but Nick Fury is definitely the best character he's ever played. He's a lot funnier, for one thing. Plus, he isn't so much of a pretty-boy in this one. He's got an eye patch, beard stubble, and is generally moody. Nick Fury is more like a real guy. And like heroes of most cinema, he has to put up with crap from his boss. He has a lot of amusing lines, but the funniest is when he tells his boss, "Guys like you tend to cling to the bowl no matter how many times you flush.". Classic. Sandra Hess, who plays Viper, is another great player in this film. She plays the crazy German persona to the hilt...way out there! There are a few things that come off kind of hokey, but you have to take into account that this is a superhero movie. Films about comic book heroes are usually kind of unbelievable in places because it's fantasy. But I enjoy this show in its entirety! Nick Fury is the government agent equivalent of Dirty Harry! 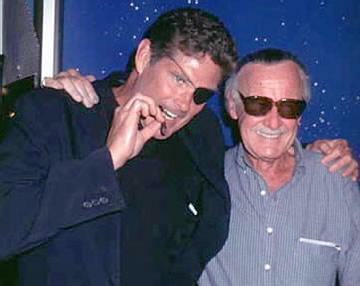 David Hasselhoff as Nick Fury, hanging out with Marvel Comics' idea man Stan Lee!